Most tumors around the eye of the horse do not metastasize, but they can be locally aggressive and have serious effects on the welfare and use of the horse. Tumors of the eye itself are very rare in horses, but tumors of the structures around the eye are surprisingly common, says equine oncologist Dr Anna Hollis. Hollis, a European and American Specialist in Equine Internal Medicine with Britain’s Animal Health Trust, has published widely in the field of equine internal medicine and oncology in scientific journals and veterinary textbooks, and has lectured both nationally and internationally. Equine oncologist Dr Anna Hollis with Teddy. Hollis, writing in Equine Disease Quarterly, says the most commonly diagnosed types of neoplasia (abnormal tissue growth) in this area are sarcoids, melanomas, and squamous cell carcinomas. When neoplasia forms a mass, it is commonly known as a tumor. Neoplasia may be benign (less destructive) or malignant (invasive and may spread to other tissues). The spread of a tumor is known as metastasis. Other tumors such as lymphoma and mast cell tumors may also be found. 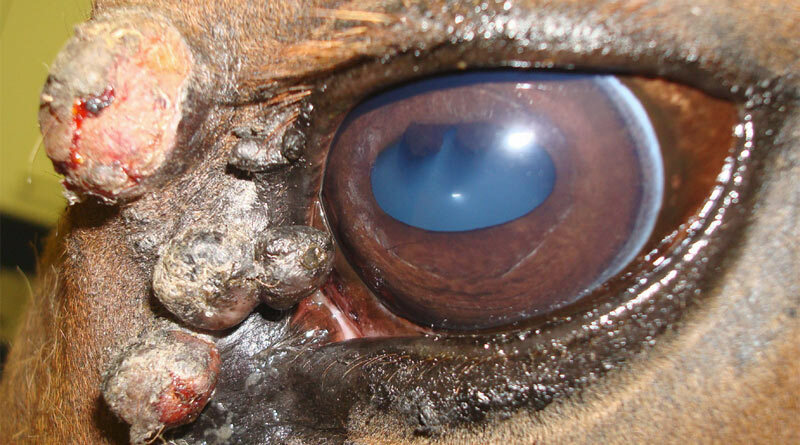 Most tumors around the eye of the horse do not metastasize, but they can be locally aggressive and have serious effects on the welfare and use of the horse. Early treatment of eye neoplasia is strongly recommended. New treatments for such issues include High Dose Radiation (HDR) Brachytherapy, where local radiation is driven directly into the tumour via catheter. The Animal Health Trust is the only veterinary clinic in Britain to offer HDR Brachytherapy, and late last year Hollis documented its successful use in an eye sarcoid in a horse. Sarcoids are believed to be the most common skin tumor of the horse and can be seen in various forms. Sarcoids that occur around the eye are frequently more aggressive in nature, invading into the eyelid musculature, especially those on the upper eyelid. Horses will usually have additional sarcoids in other locations, so a thorough examination of the horse is recommended to identify any other lesions that need to be treated. Traditionally, sarcoids were often left without treatment, but as they almost invariably become larger and more difficult to treat, early intervention is strongly recommended to avoid long-term issues. Treatment may involve topical or intralesional chemotherapy, surgical procedures (most successfully by laser surgical removal), or radiotherapy. No single treatment is 100% successful for these difficult lesions. Radiation has the highest reported chance of success, but is only available in a small number of specialty centers. Sarcoids that occur around the eye are frequently more aggressive in nature, invading into the eyelid musculature, especially those on the upper eyelid. structures of the eye itself. Although a majority are considered benign tumors, in horses that are not grey melanomas are likely to be malignant, and even in grey horses they often metastasize. melanoma may be successfully attempted, but this is a highly specialized surgery and is rarely a suitable option. Squamous cell carcinomas commonly are diagnosed in the structures around the eye, and are especially likely to occur in horses with limited pigmentation of these structures. They will eventually metastasize, and early complete surgical removal is recommended as it is frequently curative, although horses with no pigmentation will always be at risk of developing further lesions. Radiation treatment and topical or intralesional chemotherapy can also be useful in selected cases. Lymphoma may occur as a mass in, on, or around the eye, and the clinical signs associated with its development will depend on its location. structures, and without very early recognition and treatment is often fatal. Complete surgical removal of the eye and surrounding structures may be curative in some cases. successfully surgically removed. In horses (unlike in dogs) they are rarely a malignant lesion. Other tumor types are very rare, but may present in a variety of forms. It is always prudent to seek early veterinary intervention when masses arise to maximize the chance of a good result. Equine Disease Quarterly is funded by Underwriters at Lloyd’s, London. ← Jackass genomics: Did donkeys arise from an inverted chromosome?